Dell Technologies announced completion of the acquisition of EMC Corporation last Thursday, creating a family of businesses that provides infrastructure for organizations to build their digital future and protect their most important asset, information. This combination creates a $74 billion market leader with an expansive technology portfolio to solve complex problems in the industry’s fast-growing areas of hybrid cloud, software-defined data center, converged infrastructure, platform-as-a-service, data analytics, mobility and cybersecurity. Dell Technologies serves 98 percent of the Fortune 500 and comprises several market leading businesses. The two largest, and most well-known, are the Dell client solutions business and the Dell EMC infrastructure solutions business – both of which are supported by Dell EMC Services. In addition, Dell Technologies contains Boomi, Pivotal, RSA, SecureWorks, Virtustream and VMware. This structure combines the focus and innovation of a startup with the global scale and service of a large enterprise. Dell Technologies’ scale will enable it to deliver more innovation and investment in R&D, sales and marketing, services and support and deliver more efficient and cost-effective solutions for customers. Furthermore, while the company will publicly report its financial results, it is privately controlled, enabling it to better focus investments on customer and partner ecosystem over the long term. 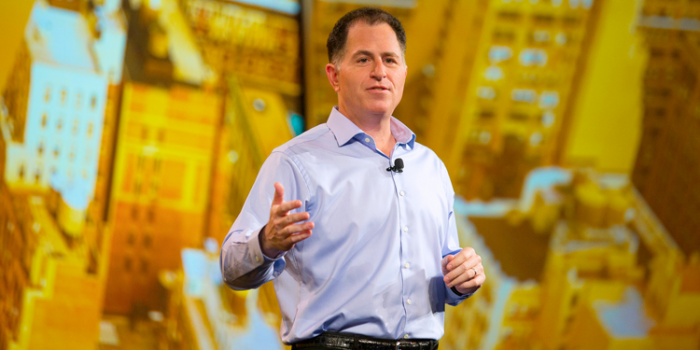 Michael Dell, chairman and CEO of Dell Technologies, said, "We are at the dawn of the next industrial revolution. Our world is becoming more intelligent and more connected by the minute, and ultimately will become intertwined with a vast Internet of Things, paving the way for our customers to do incredible things. This is why we created Dell Technologies. We have the products, services, talent and global scale to be a catalyst for change and guide customers, large and small, on their digital journey." Watch the announcement video from Michael Dell. Dell Technologies blends Dell’s go-to-market strength with small business and mid-market customers and EMC’s strength with large enterprises and stands as a market leader in many of the most important and high-growth areas of the $2 trillion information technology market, including positions as a “Leader” in 20 Gartner Magic Quadrants and a portfolio of more than 20,000 patents and applications. Additionally, Bloomberg reported that the acquisition will lead to a cut of 2,000-3,000 jobs – most of which will be in the U.S. The combined company has 140,000 employees. Bloomberg said job cuts will be primarily in supply chain, marketing and general and administrative divisions. "As is common with deals of this size, there will be some overlaps we will need to manage and where some employee reduction will occur," Dell spokesman Dave Farmer said. When the transaction closed on September 7, 2016, EMC shareholders received $24.05 per share in cash in addition to tracking stock linked to a portion of EMC’s economic interest in the VMware business. Based on the estimated number of EMC shares outstanding at close, EMC shareholders received 0.11146 shares of new tracking stock (NYSE: DVMT) for each EMC share. The value of the tracking stock may vary from the market price of VMware given the different characteristics and rights of the two stocks. As part of today’s announcement, the company unveiled its new branding.